My four year old loved these chewy little snacks so much she called them "Muncha-ma-doodles". 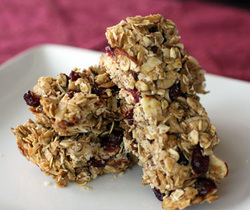 They certainly are "munch" better then any store bought granola bar -- and a whole lot cheaper! In a large bowl, mix all dry ingredients and fruit together (first 9 ingredients). In another bowl, mix remaining ingredients. Add applesauce mixture to oat mixture. Pat into a 13x9 baking dish, sprayed with non-stick cooking spray. Leave a 1 1/2 inch space at both ends of pan. Bake 20-25 min. Let cool in pan 5 min. Cut into 3 1/2"x2" bars and remove to wire racks to cool completely. Place individual bars in ziplock bags. Store in a cool, dark place for up to one week.